As the harsh New England winter refuses to release it’s grasp on the Northeast, a Riptide is set to take its toll on Portland, Maine Saturday night as New England Fights returns for a second time to the Aura Nightclub in Portland’s Old Port. Fans were treated to this unique environment for MMA back in November when the New England Fights took over Aura for the first time at NEF 31: The Old Port, which saw a Main Event for the ages as Paul Gorman climbed to 11-9 with a close decision victory over Florida’s James Blair (5-2). New England Fights returns to the venue where they saw so much success this time toting a line up of twelve matches including three professional fights, eight amateur bouts as well as one women’s submissions grappling match all being headlined by a grudge match that has been many years in the making. Make no mistake about it, Bill Jones (12-11) and Matt Denning (5-7) carry a certain amount of destain for one another as this Lightweight fight, set to headline the action Saturday night, goes far beyond the cage as both men have been in a back and forth war of words on social media that has been entertaining to watch. Bill Jones, who fights out of Nostos MMA, has been around the New England fight scene since 2007 and has made his name fighting some of the toughest men in the Northeast, including; Matt Bessette (UFC), Brian Kelleher (UFC), Tateki Matsuda (UFC) leaving Jones as a highly respected pioneer of New England MMA. In the other corner; Matt “Ken Doll” Denning, Central Maine BJJ, has fought some of the top competitors at both Featherweight and Lightweight in his career on his way to earning appearances for both Bellator and the World Series of Fighting across his twelve fights as a pro. For Denning, he will be looking to add another big name to his already impressive resume of opponents in Bill Jones, for Jones, who has little left to prove in his career, he is just looking to wipe that confident smile off the face of Denning, as Jones plans to retire following the bout. With any luck the aspirations of both fighters will spill out into the NEF Hexagon when the bell rings and the cage door locks on these two men. 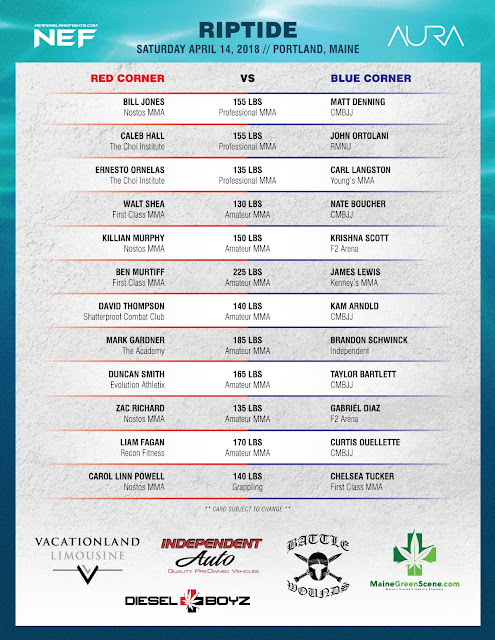 In the Co-Main event New England MMA veteran John Ortolani (8-12), who’s resume looks much like that of the aforementioned Bill Jones and Matt Denning, having fought some of the toughest dudes around, will welcome NEF Amateur veteran Caleb Hall (8-3 as Amateur) to the professional ranks as both men throwdown in the Lightweight division. Ortolani has been a staple around New England since he kicked off his career in 2009 and never looked back, “Orto” has been run through the buzz saw in his last ten fights, coming up on the wrong end of the decision in eight of those ten bouts. Enter Caleb Hall, a massive Featherweight fighter who’s three losses as an Amateur came to Aaron Lacey, Josh Harvey and Dylan Lockard, all of which have gone on to successful professional careers. Caleb will look to take the first step of his professional career Saturday night when he takes on the twenty fight veteran Ortolani. A win in his debut against the New England veteran could put Hall on the fast track in the New England rankings, and would certainly be and impressive way to commence his career. This fight between two men at much different spots in their careers, could be one of the most exciting fights of the night as both men have put themselves in spots where they can shine. Another New England amateur veteran will get his shot at the professional ranks in the nights third contest as Young’s MMA product; Carl Langston (7-9 as an Amateur) will turn pro against Ernesto Ornelas (2-7) in the Bantamweight Division. Langston has been long awaited to turn pro, following his decision victory over Henry Clark at NEF 31: The Old Port, the stage was set for Carl to make his Professional debut, in his backyard in Portland, Maine. This fight could also pack a punch as both guys like to strike and always leave it all in the cage! Flyweight contender Nate Boucher (2-2) has ended up on the wrong side of back to back split decisions against both Ryan Burgess and Justin Witham, Boucher will look to get back into the win column when he takes on First Class MMA’s Bantamweight Walt Shea (2-1). After starting his career off 2-0 Shea ran into Fred Lear (6-2) last time out who promptly handed Shea the first loss of his career. Both men are looking to bounce back off tough losses as they are set to square off at a catchweight of 130 pounds, when they highlight the amateur portion of the NEF 33 card. Wife of current UFC Lightweight and former NEF Lightweight Champion Devin Powell; Carol Linn Powell has been fighting the battle to find herself an opponent to tangle with Saturday night. Powell (0-1) who battled Francesca Morabito to a decision loss at NEF 31: The Old Port, was anxious to get back in the NEF cage following a tough loss at Aura back in November. But as it goes in the sparsely populated women’s divisions, NEF and Powell were unable to wrangle up an MMA dancing partner for the promising Women’s Bantamweight. However, Chelsea Tucker (0-2) of First Class MMA stepped up to help save the fight, as both Women will take the mat first on Saturday Night in what should be an entertaining submission grappling match. Tucker will be looking to hone her skills on the mat as she tussles with Powell, who trains under her husband Devin Powell’s tutelage, Devin who is a BJJ Black Belt will surely have Carol Linn ready to display some slick submission grappling skills. Chelsea hopes that the submission contest will help make her a more complete Martial Artist as she continues to search for her first amateur victory. Tickets, although limited, can still be purchased at NewEnglandFights.com. This event should sell out so do not waste time making your purchase if you plan to be in attendance for NEF 33’s exciting night of MMA action!